How do you grow a business venture? Well, there are many factors but creating good customer experiences is a key ingredient. Positive customer experience drives traction for your business by positive word of mouth. It is natural for customers to go for products and services that are lower in cost. Low costs have to go hand in hand with proactive resolution to problems even before they occur. An estimated 84% customers will recommend businesses who resolve issues promptly. In addition, businesses can enhance satisfaction by making it easy for customers to solve problems themselves by providing self-help facility (rather than having them to call the Help Desk). Enhanced customer satisfaction is a pre-requisite before trust can be build. Once this is achieved, targeted and personalized customer offers can be initiated to build a long term relation with customers. A good fan following with good customer support will allow you to make way for more revenue as people are willing to pay 25% extra for a better customer experience. 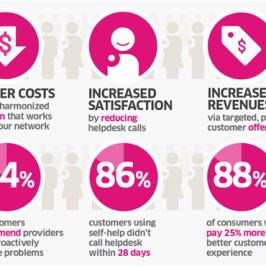 ‘Customer Feedback Management’ integrated with ‘Service Desk’ provides a path to improved customer satisfaction as well as improved customer experience.